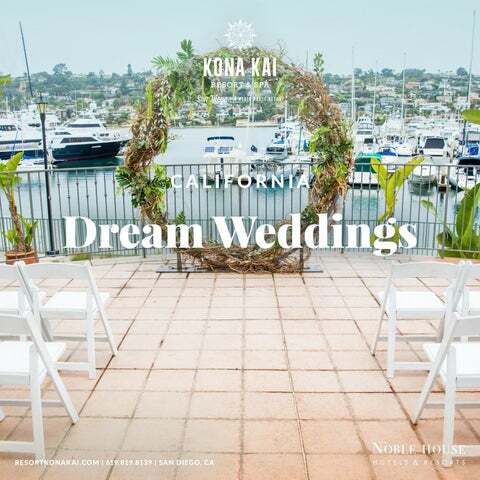 at Kona Kai With the perfect oceanfront location for a San Diego wedding celebration, our professional catering services team will assist in the planning of your memorable day right down to the smallest detail. Welcome your wedding guests to your special celebration surrounded by magnificent and panoramic views of the Shelter Island waterways in California. Dining & Catering Offering fine cuisine on the very tip of San Diegoâ&#x20AC;&#x2122;s beautiful Shelter Island in California, the Kona Kaiâ&#x20AC;&#x2122;s signature restaurant and lounge features casual elegance by the beach and a magnificent view overlooking the marina. The team of culinary experts craft special menus for both the restaurant, and your event. Choose from an intricate menu of buffets and plated options, or request your very own creations. Wedding Package Prices vary depending on package chosen. Packages can be custom designed exclusively for your wedding. For more information please contact our Catering Office at 619.819.8319 or visit our website at resortkonakai.com and click on weddings. HORS Dâ&#x20AC;&#x2122;OEUVRES Your choice of three butler passed per person. ACCOMMODATIONS Complimentary water view guest room for the Bride & Groom on the night of your wedding with a bottle of sparkling wine and chocolate truffles. Please contact your Catering Manager regarding contracting a discounted room block. ONE HOUR HOSTED BAR WEDDING CAKE Flavor and design made to your specifications by Flour Power. EVENT SET-UP Tables, chairs, linen (white, ivory or black linens), silverware, votive candles, dance floor, cake table, gift table and place card table. COMPLIMENTARY MENU TASTING Tasting of your dinner choices for bride and groom offered 60-90 days before your special day. Daily 3 hour sails departing at 12:00 pm in the winter and 1 pm during daylight savings time. Cost: $100 for adults and $50 for children under the age of 13. Private charters are available for a minimum of $1,200. Maximum number of guests is 24. 3 hours of great fun and a life time experience, includes snacks, beverages & photos. Additional resort amenities available through the Fitness Center.